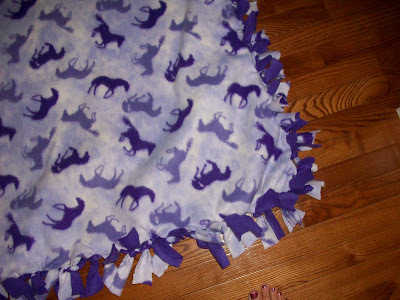 This fleece blanket was a fun nap time project I did the other day. It was meant to be a nap time project in the fall or winter, but I just now got around to it. In the MIDDLE of SUMMER mind you. Oh well, with how busy I am lately with all these birthday parties, I am lucky to have done it at all. It was super easy and would have been even easier if my GHETTO scissors would have CUT like they are supposed to. Buy 3 yards of two different prints of fleece. Cut both prints to match up evenly. Then cut the fringe (both prints at once...(this is why you need good scissors) as you want each fringe to match up) along both borders to your desired width. I choose a wider width to get it over with more quickly given the fact I was getting a BLISTER from my scissors and had 6 kids napping and had only a given amount of time to get it done. And finally knot both prints together at each fringe. I tied them together twice on each fringe. The fleece won't fray AND the knots will never come out.... even in the wash! How neat is that? Since whatever characters or things they are CRAZY ABOUT changes so fast, it's nice to not have to spend a lot of money when in two weeks they will LOVE something or someone NEW! Mia obviously has a THING for horses that, I am guessing (& hoping since we did her entire BEDROOM in a horse them), will last a few years. So I chose this cute HORSE print for her. I NEVER see GIRLY horse prints, only brown, green, blue and all very WESTERN-ISH. Which, don't get me wrong, is super cute. But when I saw this girly version I had to get it for her. 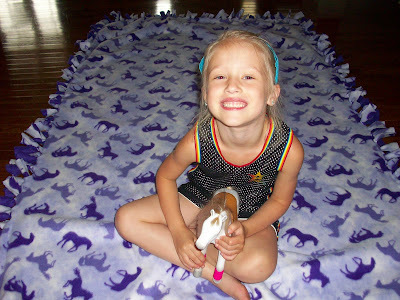 She loves it so much and uses it on TOP of her awesome horse QUILT seen in THIS POST. 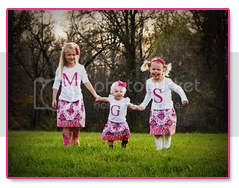 It is the best feeling in the world to MAKE something for my girls. It means so much to them that I take time out of my CRAZY BUSY life to do something just for them. Try this today! And leave me a comment and let me know how it goes. I think i will have to do this for my munchkins after payday. so easy and cute. I love it! Seriously, it's waaaay too cute for words! So you line it up, cut the fringe and then tie the fringe? Did you sew them together first? Sorry for the rush of q's...but I would love to do this for my Isabella!